Chen, who has studied at Harvard University and at Johns Hopkins University's center at Nanjing University, said he didn't understand what the United States was attempting to achieve by threatening China. "You're not going to get 1.3 billion Chinese to change by insulting them," he said. "Could it be related to upcoming elections? I don't know. Because economically it makes no sense." Chen said if the U.S. threats were geared toward limiting imports and decreasing America's trade imbalance that way, it wouldn't work. Perhaps imports from China would fall, but that wouldn't mean that Americans would start producing goods such as telephones and TVs again. "That production isn't going to return to America, that's just not practical," he said. "Globalization has changed all that." "But if you want to increase your exports, this strategy also won't work," he warned. "How are you going to get China to buy more of your products if you insult it?" Talk of imbalances in trade diverts attention from the real problem: Uncle Sam’s gargantuan debt. That fast-accumulating debt is a huge problem. It is caused, though, not by trade with China but, rather, by Washington’s lack of fiscal discipline. Unless you believe that protectionism (and only protectionism) would induce Congress to be more fiscally disciplined, you should avoid all talk of imbalances in trade and instead talk of imbalances in political institutions that encourage politicians to give disproportionate weight to the demands of current voters and to ignore the resulting ill-consequences that will curse future generations. Boudreaux hits on something that I've discussed a few times - the source of the real "instability" in the US-China relationship is the obscene debt-monster on Capitol Hill, not the RMB (something big spenders like Paul Krugman conveniently forget about, even though he wrote a textbook on the issue). But why would our free-spending political class want to focus on that silly detail, right? Ugh. 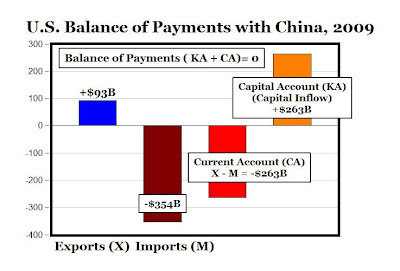 He then states: "As Don correctly points out, there really is NO trade imbalance, when we account for: a) exports and imports of goods and services, AND b) capital inflows/outflows. Stated differently, the balance of payments is always ZERO. We buy more of China's goods than they buy of ours, but then China buys more of our financial assets (bonds and stocks) than we buy of theirs. So in the end, international trade with China, is balanced, not imbalanced." Great stuff. Too bad, these "facts" and "common sense" have absolutely no place in the current China currency debate. Exit question: with China now predicting its own trade deficits (and with the RMB's value holding steady, no less! ), does that mean that their politicians will all go as freakin' crazy as ours?